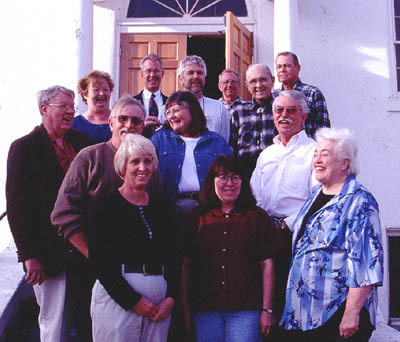 First convened in June,1997, the Grafton Heritage Partnership Project (Partnership) is a volunteer non-profit organization governed by a Board of Trustees selected from participating organizations and families. The Partnership unites the interests of federal, state, local governments, private landowners and community groups to effectively work toward preserving Grafton as an historic site. The Partnership’s purpose is to preserve and enhance the outstanding historical, agricultural, scenic, riparian, and cultural values of the Grafton historic townsite for the benefit of present and future generations. A statement by John Ruskin (1819-1900) a founder of the National Trust made more than a century ago says it best about what we are trying to do at Grafton. …”and if we do our job well, it is possible that our children will say, see they did this for us; they saw the beauty of the landscape and worth of these buildings, they protected and nurtured them and they passed them on to us”.…..
Dr. Douglas D. Alder- was a founding member of the Grafton Heritage Partnership Project. Dr. Alder moved to St. George to serve as president of Dixie College after teaching European History for 23 years at Utah State University. He was president of the Washington County Historical Society 1996-97. He has written many books on history. At the same time Dr. Alder created and organized “St. George Live.” This ongoing program of first person historical re-enactments at ten historic sites draws on the talents of over 175 volunteers to share the history of St. George. He has also served on various preservation committees, including the Pioneer Center for the Arts and the Downtown Redevelopment Advisory Board of St. George. Was chairman of the Washington County Library Board and works with many other community groups.